On the Ropes. Yes, the kind you tie stuff with. This entry was about to turn into a buyer beware entry on the Blueline 1/4″ Utility Braided Rope, but I realized that I just didn’t know as much as I needed to about rope. I always do at least a little bit of research both before a purchase, and after I decide something is worthy of a review. Who knew there was so much to know? Prior to a recent camping trip, I found myself standing in the hardware section in front of a wall of rope. I wanted some additional rope for the tarps that I use to provide an extra layer of protection in the event of a downpour. I tie them to trees around the campsite, good and snug. 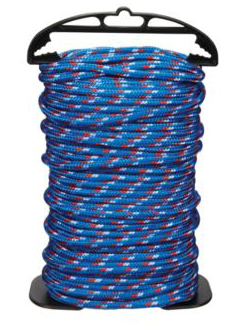 I ended up with a the braided polypropylene rope: it looked fancy, came in a nice spool, and was rated to about 60 lbs. I learned that Polyester ropes are actually much better for what I was trying to do. Polyester ropes don’t stretch as much as polypropylene, resists elongation better, and has good resistance to moisture problems. Polypropylene is lighter weight and float, and does not resist elongation as much – it is also cheaper. There were a couple of really good comparisons on the Web, including some narrative that provides more chemistry for those in-the-know about the science of materials. There you have it: things you should know. Pretty to look at. Not for camping. The bottom-line: If you want to keep your tarps taut, stick with the polyester rope. ← Why Aeroplan is Horrible. Or, is it? Gesh I just can’t tell.